Do you have a subject you would love having painted? 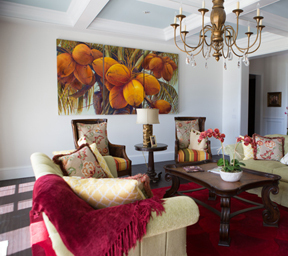 Do you have a specific space you would love a painting for? and help you celebrate life through telling a visual story. Contact me to create art you can love! At the 2015 Coconut Grove Arts Festival, I heard a woman say to her husband, "It's her, we found her!" They had seen me at a previous show and came back to look for me again. The triptych painting they commissioned is now hanging in their home! "We love it! It's hung and looks absolutely fabulous!!! It makes such a bold statement, which was what I was going for. You are so blessed to be so talented. What a gift you have!!! And, I am so blessed to be able to have some of your work." 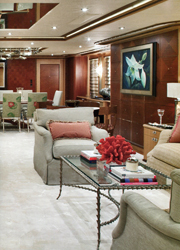 I was commissioned for a project of six paintings for the ISA 63 Super yacht, Kolaha. 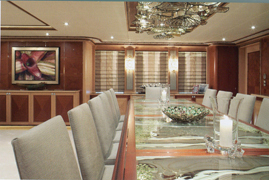 My artwork was featured in the Yacht Premiere's N18 pictures of the main salon (two shown here). Commissioned to combine my love of nature with something more "out there", this painting developed from a vision God created in my heart (and on canvas). The three roses represent the Trinity. The light beams represent God revealing Himself through nature. The dove started appearing without my planning. God wanted His Holy Spirit's work shown in His revelation of Himself! "The Light Revealed" became a statement piece for my heart's passion in my art. "Charles and I commissioned the painting 'Oklahoma Memories'. We chose Jayne Vander Woude because we appreciate her incredible talent. More important in our selection was her obvious sensitivity and appreciation for our emotional attachment to this property. Because of a very painful detachment, I wanted to preserve the image of this barn in particular. This barn was constructed over sixty years ago, shortly after the land was purchased by my father. In addition to the usefulness in the farming operation as well as the sentiment that Charles and I feel, the old structure is home to a very rare species of owls. Jayne Vander Woude captured the essence of this structure and its inhabitants as well as the surrounding area. Numerous members of my family enjoy copies of this work of art which reminds all of us of a very loving father, grandfather, and great grandfather who valued the land as God teaches us in His word." The images on this website are the property of Jayne Vander Woude.